At about 9:30 on Sunday, July 23rd, we arrived at Kamehameha Iki Park in Lahaina to see if 5690 would return for a fifth nest. When we got there, we were truly surprised to see her tracks up, down, and sideways, all over the beach. It was one dark night! Fortunately it wasn't a stormy night. It took 5690 longer than we'd expected to show herself again, perhaps because of the family of four who chose to night-snorkel using an industrial strength flashlight. Once the snorkellers left, we figured it would be all quiet on the Lahaina front, but then we noticed a cigarette lighter flare up. A woman and her companion were now curious about the odd markings trailing from the ocean and up, down, and sideways, all over the beach. Ursula went over to them and asked them to darken it please. The woman asked what the odd markings were. "Turtle tracks," Ursula said. She then informed the couple that the turtle was due to crawl back onto the be... and that's when Ursula saw 5690's white throat as her head poked out of the water. She was waiting patiently in the shallows. Ursula pointed to the turtle and said, "That's her, and she wants to come ashore." The couple stepped into the darkness to watch. Eggs laid at about 12:45. Cover-up flinging started about 1:15. Went back to the ocean about 3:05 or so and--get this, soon as she hit water, there was a shooting star dropping from the sky straight down toward her. Just like what happened in 2004. Could've been a replay. I'd like to think it was a salute to Mr. Sasaki. When she was in her trance, Peter took the red light and inspected her all over. All body parts accounted for. Perfect eyes--meaning zero hint of FP. Needless to say, we have no photos of the night's magic. Next morning, we returned to inspect the nest and to our delight we discovered that someone had already roped off the area. While there, a young man approached and looked down at the first nest, a few yards makai from where 5690 had dug the night before. He asked us what was happening since the eggs should've hatched by now. We told him we weren't exactly sure, but this nest had been constantly awash with the high tides and swells, so it would probably take a few extra days--provided the eggs were even surviving. Then we mentioned that it wasn't clear that the ropes were in the right place. Someone had taken them down at some point. Although they were put back up, now no one can be sure that the egg chamber is actually protected. We told him that for all we knew, as we were gazing at the nothing that was not happening inside the ropes, we could be standing right atop the hatchlings as they were trying to dig their way up! That did it for him. He said he was getting some caution tape and he'd be back. 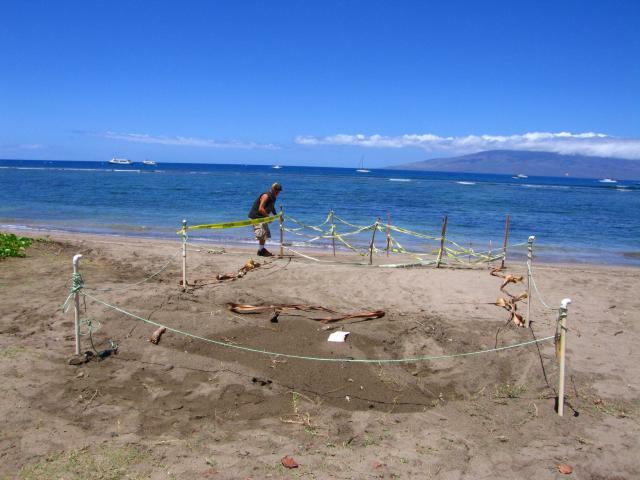 Then this Honu Samaritan roped off everything. We Canadians have to hand it to that American for knowing how to protect tiny youngsters of a threatened species! For two days this week, we actually had Visibility! The ocean had cleared enough to make for terrific photography except for one thing: there was also a strong current that sent our bubbles burbling to the surface at an outrageous angle. New moon--what can we say? When currents get this strong, the honu hunker down in their Turtle Tramples and pukas. When they're at the surface for air, they get swept downcurrent quickly. We can see this effect by using binoculars from shore. So it's been our experience that on strong current days, honu prefer to ho-hum it just snoozing on the bottom--cocooning out adversity--much like Canadians wait out a January blizzard. 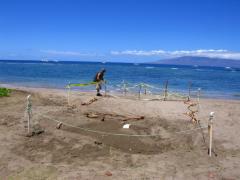 So while we had the improved visibility for terrific photographs, the honu subject matter were dormant. For many, the most interesting thing they did was to open their eyes when we were about. We got a lot of profile shots though--as we've said frequently this summer, "My, there's a lot of turtles!" This week they just weren't doing much. There was one exception. The new hawksbill here never rests. She skittles over the reefs searching here, digging up corals there, all in the hopes of a meal. 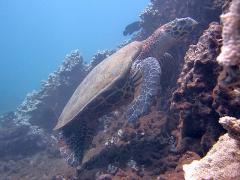 So thank you hawksbill for a photo we can post to Turtle Trax this week. Seen any tasty sponges around? We couldn't dive. So Ursula suggested we kayak to Lahaina, where one of us could take a cab back to the condo to get the car and come pick up the boat. Ursula is an idiot and the only bigger idiot is Peter who agreed to Ursula's suggestion and suggested that instead of cabbing back, we should paddle! Almost as soon as we started out, we were rewarded. A pod of dolphins swam directly towards us, and we got to see them up close. That was the extent of the reward part, though, except that we can say that we did it and we're proud. Tired and in pain, but proud. 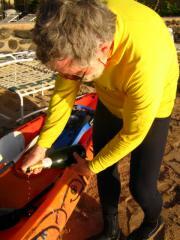 We celebrated with champagne. We poured champagne on the kayak and then into the ocean to give thanks. No champagne to the wind though. We drank the wind's share. The trip took seven hours, from 11:15 to 6:15. Our legs were so rubbery, we had a tough time beaching the kayak. As idiots, of course we kayaked at the height of a blazing sun. We did put our idiot-status at risk by using lots of SPF 70 sunblock. Peter had his hat-tent on but Ursula had only a baseball cap. Eventually she took one of the large flags we brought with us to help shield herself from the sun. We used the Corporate flag of the Corporation of Mississauga--big and blue, and it actually helped shade Ursula; however, it also made our kayak look like it was smuggling a potential terrorist! Since she didn't want a 500-lb bunker-buster bomb dropped on our kayak, Ursula took her American-Flag scarf and tied it around her neck for protection. It worked! As far as we know, no 500-lb bomb hit us--although that night, our shoulders and arms had their doubts. Obvious lessons here? Do we even need to state them? 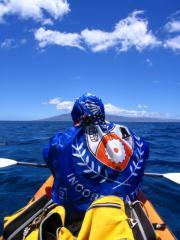 Don't kayak downwind to Lahaina and then fight your way back upwind! Ursula's arms ached so much during the night, she had trouble sleeping. An American flag works better than a helmet! Last week, we reported that Hoa had returned safely from his French Frigate Shoals reproductive journey. This week we took the time to conduct a health check on our old friend. Hoa has white gouges on his carapace that suggest he had a shark encounter. As for the big chunk taken from his right flipper? 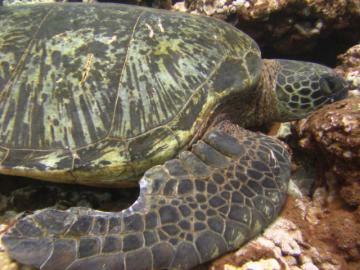 We suspect other honu males biting at Hoa during mating but we'll check with George Balazs for his expert opinion.